The Feel Unique Skincare Event - discounts of up to 33% available! If you read my post on 'How To Buy Luxury Skincare For Less' then you will know that I buy the majority of my skincare products in sales or when discounts are available. I also like to share discounts with you when I find them so I had to tell you about the Feel Unique Skincare Event because there are discounts of up to 33% available! Brands included in the event are Gatineau, Murad, La Roche Posay and more. There is currently a 25% discount on La Roche Posay and two of my favourite products from the brand are Redermic R Eyes and Toleriane. As you can see from the tube above, the eye cream is well loved and this is my second tube! It's very light in texture so it absorbs quickly but it's delivers a powerful dose of hydration and feels fresh on the skin. I find that it plumps my under eye area and fine lines are less visible, also concealer applies more evenly when my under eye area is nourished. Toleriane is a moisturiser that I recommend to everybody who has reactive or sensitive skin. It instantly soothes but also hydrates the skin making it feel comfortable and look fresh. 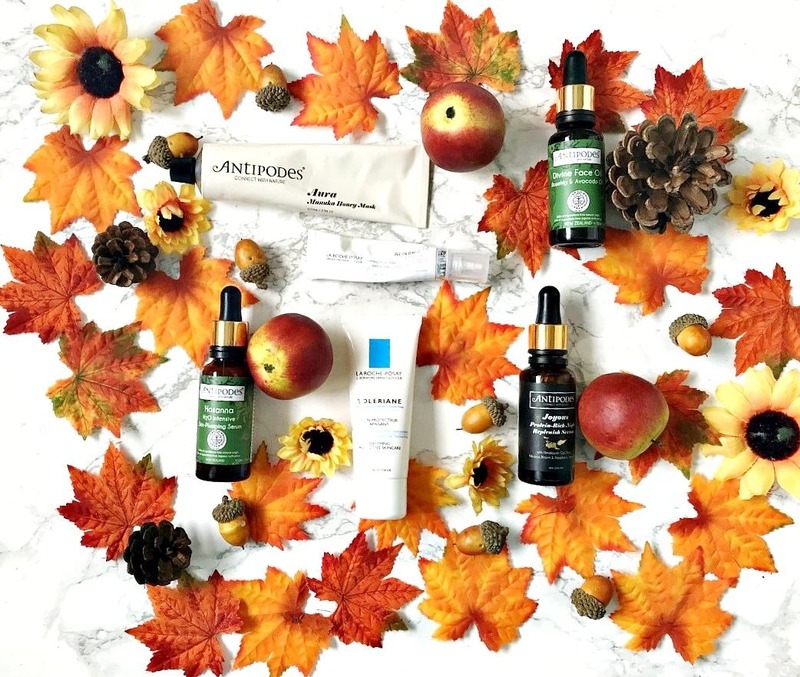 There is 20% off Antipodes - an organic and natural brand with so many nourishing products. Aura Manuka Honey Mask is one of my favourite products from the brand because it does so many things - cleanses, soothes, hydrates, heals and reduces inflammation. Joyous Protein-Rich Night Replenish Serum is comprised of goji berries, which contain 19 Amino Acids, Raspberry Seed Oil, Blackcurrant Fruit Oil and a host of other Vitamins and Omegas. The result is nourished and plump skin. Hosanna Intensive Hydrating Serum is perfect for morning routines if you have dry skin as it nourishes the skin and increases elasticity. I love a good face oil, especially as a last step in my night routine and Divine Face Oil is an excellent choice. Avocado and rosehip oil, sweet orange rind and jasmine petal combine to create a light oil that is a real pleasure to use and results in soft, hydrated and supple skin. It's ideal for the Autumn/Winter months ahead. The discounts are really great so if you need to stock up on anything or you have products from these brands on your wishlist, now is the time to buy! These discounts are available until October 21st. Are you planning on making any purchases during the skincare event? I'd love to hear what your favourite skincare brands are? All products are bought by me, unless otherwise stated. This is not a sponsored post but the Antipodes products were kindly sent to me. Opinion is always my own. Affiliate links may be used.